This page shows how to perform common tasks with hotlists in Google Issue Tracker. When you create a hotlist, you are granted Admin permission and it is private to you by default. You must change the permissions on the hotlist in order for it to be visible to or modifiable by other users. Click Create Hotlist, located near the bottom of the left-hand navigation. The Create a New Hotlist window appears. Enter a name for the hotlist. The hotlist appears in the left-hand navigation in the Hotlists section. You can also create a hotlist with the hotlists picker found on an issue page or in a bulk edit, or from your Hotlists Summary page. You must have Admin permission for the hotlist in order to edit its properties. In the left-hand navigation, find the hotlist you want to edit. Hover over the hotlist and click the drop-down button. The hotlist details window appears. Rename the hotlist or add/modify its description. You can also edit a hotlist from its page of issues by clicking the pencil icon next to the hotlist name. You can identify important hotlists by starring them. 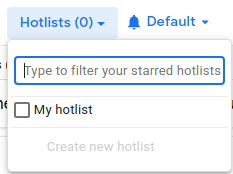 Starred hotlists also make it easy to add or remove issues. Note: Hotlists that you own are starred automatically. In the left-hand navigation, select the hotlist you want to edit. You must have Admin or View and Append permissions to a hotlist to add or remove issues. Navigate to the page of the issue that you want to add or remove. Click the Hotlists picker button in the App Bar. Check or uncheck the box of the hotlist for which you want to add/remove the issue. Note: If you do not see the hotlist you want, you may need to star it. See Starring a hotlist for more information. You can use the same hotlist picker to simultaneously add or remove multiple issues to or from a hotlist during a bulk edit. You must have Admin permission for the hotlist in order to set permissions for other users and groups. In the left-hand navigation, find the hotlist where you want to change permissions. Click the Access Control tab and grant permissions for the hotlist as required. Any user or group granted permissions to the hotlist must have a GAIA (Google Accounts and ID Administration) ID. Otherwise, the permission grant fails and you receive a warning bar that reads: Owner [USER_NAME] is not a Gaia account. You must have Admin, View and Append or View Only permission for the hotlist in order to add it to the left-hand navigation. Click the magnifying glass icon next to Hotlists in the left-hand navigation. Where prompted, search for the hotlist by keywords in its name or description. You can only search for hotlists where you have Admin, View Only or View and Append permissions. You can also use owner:[NAME] to search by the name of a user who has Admin permissions to it. Hover over a hotlist name for more information as presented in a hotlist hovercard. To add a hotlist to the Hotlists section of the left-hand navigation, click the star next to the desired hotlist. To view the list of issues in a hotlist, click on the desired hotlist. You can also add the hotlist from the issues page by clicking the star icon located to the left of the hotlist name. In the left navigation pane, find the hotlist you want to view. Hover over the hotlist name and click the drop-down button. An overlay window appears providing the hotlist ID, name, description and owner. If you have Admin permissions for the hotlist, an Edit option appears instead of Info. 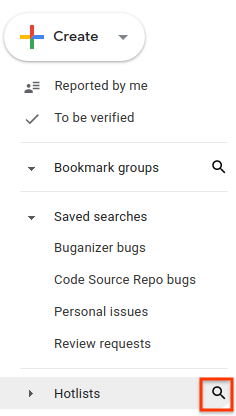 You can also view information for a hotlist from its page of issues by clicking the clipboard icon next to the hotlist name. To remove a hotlist from the navigation. Find the hotlist you want to remove in the left-hand navigation. If you have Admin permissions for the hotlist, click Settings instead of Unstar and then click Archive Hotlist in the hotlist details page. You can also unstar a hotlist from a hotlist's page of issues. You cannot unstar or remove hotlists where you have Admin permissions. Instead, archive such a hotlist. Last updated July 11, 2017.